A human cell contains a number of organelles that are each have have a different role to play in maintaining the cell and preventing the cell from becoming damaged. Cells are the units that make up the human body - each cell has a role within the body (eg. protection - keratinized squamous epithelial cells of the skin - or secretion - mucous-secreting columnar goblet cells of the respiratory tract) for which it is designed and specialised. This article covers the components of the "standard" eukaryotic cell (cells with enveloped nuclei). An organelle is a component of the cell with a specific function. 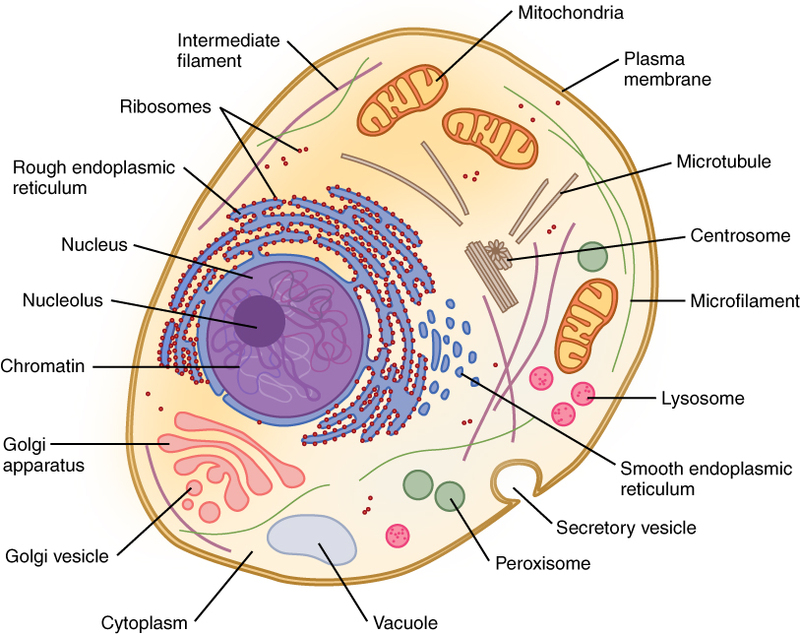 Diagram: The eukaryotic cell, with its various organelles labelled, each with a specific function (Source). Function: the site of ribosomal RNA (rRNA) synthesis, where it is combined with proteins to generate incomplete ribosomes. These ribosomes then mature after being exported from the nucleus in the cell, where they either attach to rough endoplasmic reticulum or become free-floating ribosomes within the cytoplasm. Image: Transmission electron microscope image of the nucleus, nuclear envelope and nucleolus (Source). Ribosomes are attached to the outer surface of the membranes, making them "rough"
Image: The structure of the mitochondria (Source). In the space of the inner membrane lies the matrix where the TCA/Krebs cycle takes place and contains mitochondrial DNA, ribosomes and soluble enzymes. Image: Colour T.E.M is showing the mitochondria (red) with the RER and SER (both blue – RER is slightly darker blue due to ribosomes) (Source). Composed of two strings of actin and measure 5nm in diameter. They are associated with ATP so microfilaments are contractile & assemble and dissociate very quickly (dynamic). Unlike microfilaments, they are not dynamic and are 10-12n in diameter. Their function is form a tough supporting meshwork within the cytoplasm and are anchored to the plasma membrane at desosomes (strong intracellular junctions). Tubulin subunits polymerise to form the wall of the hollow microtubule. They originate from the centrosome and found at sites in the cell where structures are moved -> nerve fibres, mitotic spindles, cores of cilia & flagella.